A drive belt, often called a serpentine belt, is a rubber belt looped around several pulleys that is rotated by the engine crankshaft transferring the power to the vehicle’s peripheral systems. Some of the components the drive belt powers are the alternator, power steering pump, water pump, air pump, windshield wipers and air condition compressor. The belt may also be guided by an idler pulley and or a belt tensioner pulley. Cars that have a serpentine belt for the most part have only one belt and in some designs two belts. Most modern cars have only one belt. If the car has a v-belts, it will most likely have four belts. 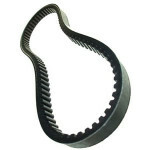 Serpentine belts are built to last an average of 60,000 to 100,000 miles. Whether your belt needs to be tightened or replaced our North Attleborough drive belt services can have you back on the road in no time. Our experienced mechanics will inspect the belts for cracks, inspect the pulleys and bearings, remove and replace any damaged or worn parts.